Toast quinoa in a large dry skillet over medium heat, stirring often, until it crackles and becomes aromatic, 3 to 5 minutes. Transfer to a fine sieve and rinse thoroughly. Heat oil in a large saucepan over medium heat. Add onion and cook, stirring often, until softened, 2 to 3 minutes. Add chiles and garlic; cook, stirring, for 30 seconds. Add the quinoa and broth; bring to a simmer. Reduce heat to maintain a gentle simmer, cover and cook until the quinoa is tender and most of the liquid has been absorbed, 20 to 25 minutes. 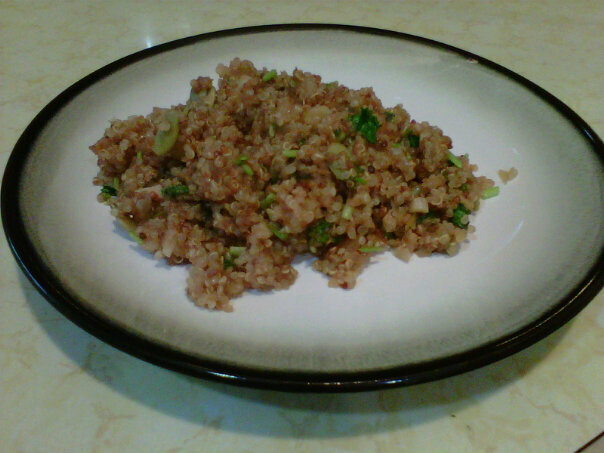 Add pumpkin seeds, cilantro, scallions, lime juice and salt to the quinoa; mix gently and fluff with a fork.